Peter Batty worked for BBC TV and ITV before setting up his own production company to produce, direct and write for film and TV. Successful productions included awards from Venice and Leipzig Film Festivals. 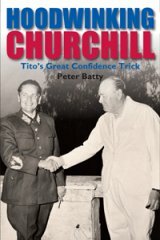 He made 2 films on Tito for the BBC which proved controversial and led to this book. What is 20 - 6 ? Very interesting and also a good read. This book is a must! A great deal of fascinating information.Good history very well researched. A very interesting and enjoyable history lesson - amazing information from a well-informed author. Well researched, well argued, excellent writing style. A subject that needed more light shone on it. Peter Batty provides a searching examination. A great read. Peter Batty on top form again. An exquisitely written and compelling book -- Mr Batty has done justice to a controversial topic. I couldn't put it down! Wonderful contribution to an almost forgotten rogue. Thank you Peter Batty! Warm congratulations at this publishing milestone. I thought there was nothing new to read on Churchill but Batty has proved me wrong! This is a very important and long overdue book.By means of painstaking research it convincingly demolishes the 'received' British account of the 2nd World War conflicts in Yugoslavia.It guides the reader through a highly complex narrative with remarkable clarity.